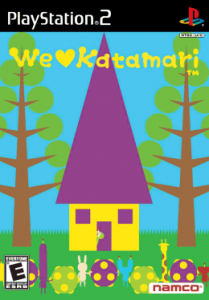 I remember really getting into Katamari Damacy, with dodgy controls, but a decent concept that appealed enough to me. In fact, I keep looking out for news of rereleases for it as that might solve those problems. The game’s sequel is on the list as well, though no others, and it sounds like it added a bunch of polish that would be great – I’ve certainly been looking forward to try this. First of all, this game is as weird as it was before – possibly weirder, even, and we were wondering what drugs they would have been on when making this. The plot is self referential – after the success of the first game, it’s gotten to the characters’ head and the storylines riff on that. In part, you’re trying to help out people who have heard of you and want your help again. It’s bonkers at times, but suits the tone of the game throughout. The game’s formula stays the same too – start rolling this ball, make it bigger until you get to a certain size, often within a time limit. There’s a few different areas with a bunch of changes, which make it a lot of fun, and the controls felt better this time – I believe they improved some of these as well. The one feature that’s missing from this game that would have been nice is an endless mode. It’s going to sound like a smaller thing, but I wish I could have the option to see how far I’d get without the time pressure. It feels like an odd omission from the game and one I’m glad only seems to have been done for this entry in the series. I only get more charmed as I play more Katamari games. The concept is weird enough anyway, but the story and execution are so bonkers that it’s amazing even without having to gather small dogs on your katamari. But since you get to do that as well, this is just even more amazing.